Breastfeeding is nature’s most powerful way of helping mothers recover from birth, learn parenting skills and fall in love with their babies. It’s also nature’s way of ensuring that babies are well nourished, protected against disease and allowed to develop optimally. The American Academy of Pediatrics (AAP) recommends that babies be exclusively breastfed (no water, juice, formula, other fluids or solids) for six months and continue breastfeeding until at least one year. However, whether or not you breastfeed, there are several ways you can bond with your baby. Following are some tips to encourage you to begin breastfeeding and bonding with your baby. 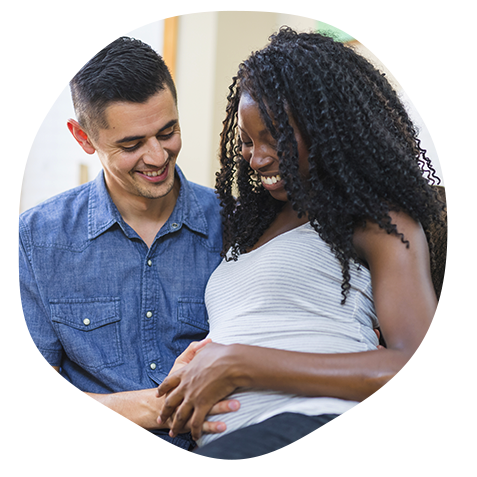 Download The Right Support for Breastfeeding Tip Sheet! Talk to parents who are breastfeeding or have breastfed babies. Watch babies at the breast. Attend a La Leche League meeting. Get the name of a lactation consultant. Remember that your body knows how to breastfeed your baby. Talk to your caregiver about delaying newborn testing and other routine procedures. Keep your baby skin-to-skin with you. Watch for early infant feeding cues. Breastfeed your baby within the first hour after birth. Delay newborn tests and routine procedures until after the first breastfeeding. Remember that colostrum is nutrient-rich and that your baby doesn’t need to eat much in the first hours and days of life. Sleep in the same room with your baby and be together as much as possible. Don’t limit your baby’s time at the breast or hold your baby off between feedings. Let your baby finish the first breast before offering the other. Learn how to tell if your baby is swallowing milk. Learn how to tell if your baby is getting enough milk and trusting that you will produce lots of milk. Learn how to position your baby for a good latch on the breast. Don’t use bottles or pacifiers until breastfeeding is well established. Be patient with yourself and your baby as you both learn to breastfeed. If you choose to circumcise your child, wait at least 24 hours after birth and insist that the baby be given pain medication. Be prepared to provide extra soothing and wake your baby to breastfeed if necessary. If you need to be separated from your baby, pump your breasts and store your milk. Don’t supplement your breast milk with formula unless there is a clear, compelling health reason. Remember that responding to your baby's needs does not spoil them; rather, it’s the only way you can teach your baby to trust you. Continue to sleep in the same room with your baby and be together as much as possible. Wear your baby in a sling or other soft baby carrier throughout the day. Breastfeed your baby whenever they show signs of hunger (eight to 12 times every 24 hours). Learn to breastfeed lying down in bed so you don’t need to wake fully to breastfeed at night. Remember that breastfeeding is a top priority. Stay confident and be patient, even if your breastfeeding journey is bumpy. Call a lactation consultant, your local La Leche League leader, or use the La Leche League International online locator to get help if you have breastfeeding problems or are concerned about whether your baby is getting enough milk. Remember that breast milk is all the nutrition your baby needs for at least six months. Respond to your baby’s needs before they cry. Hold your baby skin-to-skin, make eye contact and talk to your baby.